This peaceful area was discovered in the mid-1970’s by a new generation of bohemian intellectuals from São Paulo. After their college education they wanted nothing more than to walk around barefoot, smoke pot and play guitar into the wee small hours and this remote stretch of paradise offered the perfect escape from the big city. 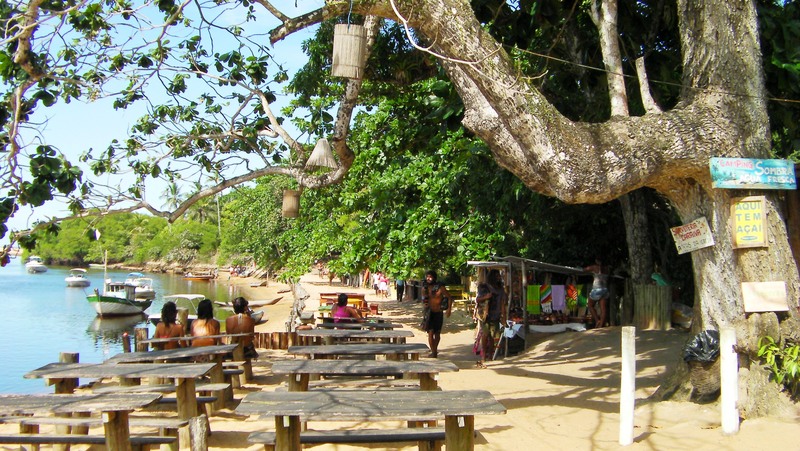 Free spirited travellers spread the word about this slice of heaven but it wasn’t until the late 90’s, when the construction of a paved road linked these villages to Porto Seguro, that the area really made its mark as a holiday destination. Arraial is situated on a grassy hill top with mesmerising views across the beaches and ocean. 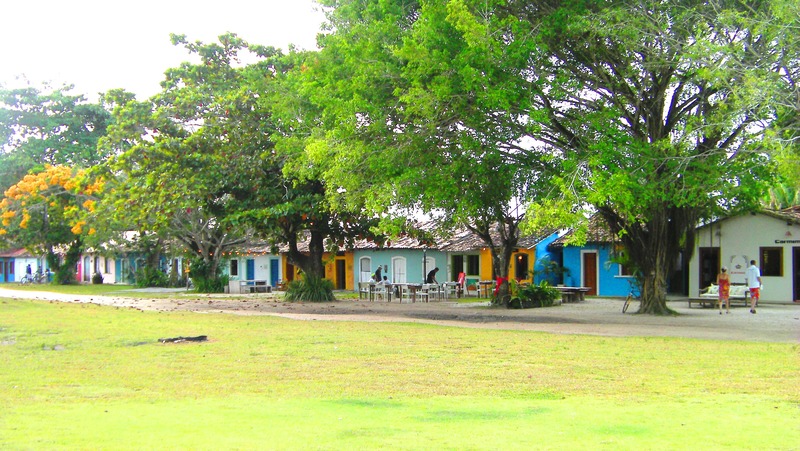 Despite mass-development, the village still has a tropical feel, with a good amount of green space and lush fruit trees. The village’s colonial character has also been preserved. 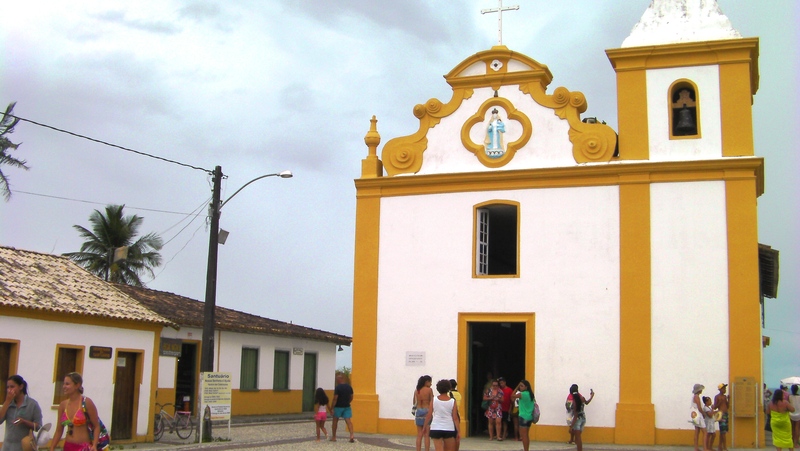 The cobblestone streets are full of brightly painted cottages and at the heart of the main square, the sixteenth century church of Nossa Senhora D’Ajuda is a delightful historic attraction. Around the square there are bakeries, artisan shops and some decent accommodation options. We stayed at Pousada e hostel Alto Mar, down a lane at the back of the church. Our cosy en-suite double room (approx. $20 USD per night) had a small porch with a hammock, ideal after raiding the well-stocked library. Their tour desk can book up local excursions and capoeira classes. Set around a lush green garden, the pousada offered breakfast each morning and had a communal kitchen for guests to use. It was just a short walk to all of the attractions but offered a peaceful location for a good night’s rest. The main beach, Praia Mucugê, is a short 10 minute walk down through the centre of Arraial. The powdery sands are edged by pink cliffs and palm trees. The water is crystal clear and the offshore coral reefs break up the large waves making it a calm spot for swimming. The natural beauty of the beach is somewhat interrupted with rows of barracas (stalls) playing loud music and claiming their turf with plastic tables and sun-loungers fitted with parasols. Hawkers selling sarongs and sunglasses frequently wander this section of beach and can become a little persistent. 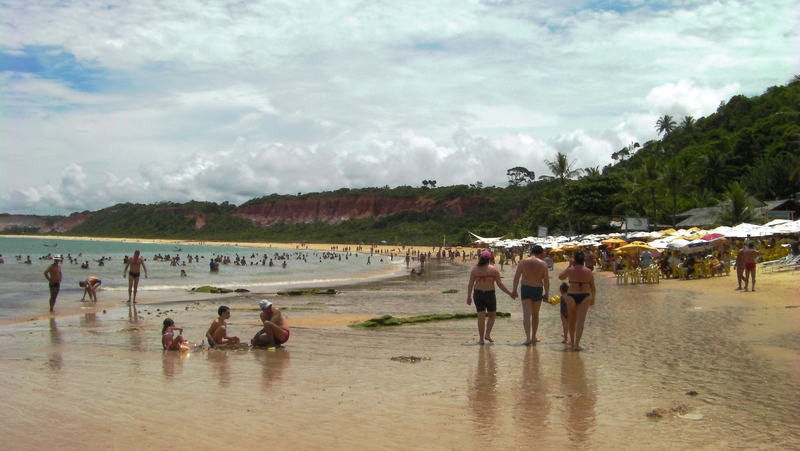 On the plus side the atmosphere at Praia Mucugê is deliciously upbeat and you can buy some very tasty fresh seafood and cold beer here! 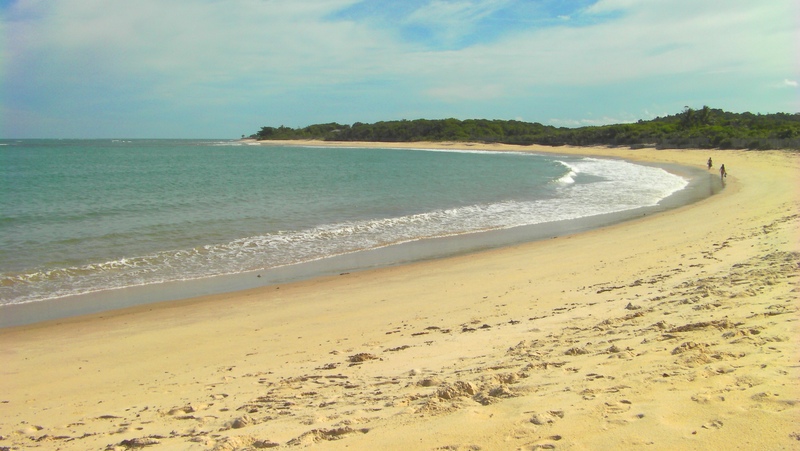 In need of more peace and quiet, we walked further south to enjoy a relaxing and crowd free day at nearby Parracho beach and further still Pitinga beach. When the tide goes out here natural pools of warm water are left behind and tiny translucent fish dart around your toes as you paddle your feet. Doing absolutely nothing is a perfectly good option but many tourists also like to take advantage of the range of activities on offer here such as stand-up paddle boarding, windsurfing, kayaking and snorkelling. In the early evenings a buzzing market appears selling local food and crafts. Souvenirs made from materials such as coconut husks, sea shells, ceramic and stone make a fun (if a little tacky) gift or more appealing are the traditional fabrics, clothing and handmade silver jewellery. Whilst you browse, hippies play the Tamborine, drums, banjo and maracas for tips. A real crowd pleaser at the market is the indigenous Indians in tribal outfits who sell handicrafts and charge for photographs. 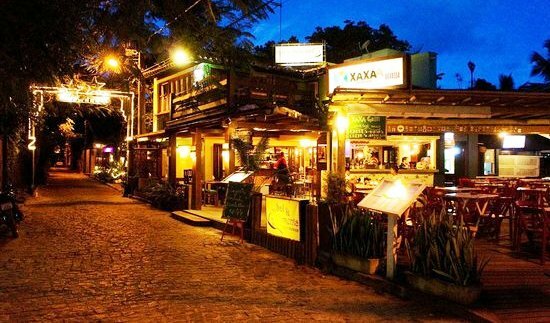 As the night progresses the streets are transformed with bright modern bars and restaurants. Along lively Rua do Mucugê, persistent waiters waive menus outside their restaurants to compete for your custom and offer free drinks to entice you through the door. Along this strip the restaurants have a distinctly international feel with burgers, steaks, pizzas and tacos on offer. To discover restaurants with more of a local atmosphere and flavour simply try some of the backstreets. We particularly enjoyed Cafe da Santa for its tasty cakes and pastries and Restaurante do Paulo Pescador for its friendly service and tasty fresh fish. During summer, live concerts are regularly held here by famous Brazilian groups and an atmosphere of celebration prevails. Late evenings are particularly energetic with local bands playing live music in bars and beach clubs pounding out techno tunes. The merriment and dancing continues into the early hours, if you wish. This hippie-chic destination is the sort of place where millionaires go to pretend to be poor. It attracts fashionable jet-setters looking for the high life in rustic surroundings. As if the miles of unspoilt coastline weren’t enough, there’s boutique accommodation, trendy shopping, funky bars and fine dining restaurants. Billed as a cross between the Hamptons and Ibiza, it’s not uncommon to spot private helicopters delivering guests to Trancoso’s helipad and to hear the popping of corks as waiters serve up champagne to beautiful people. 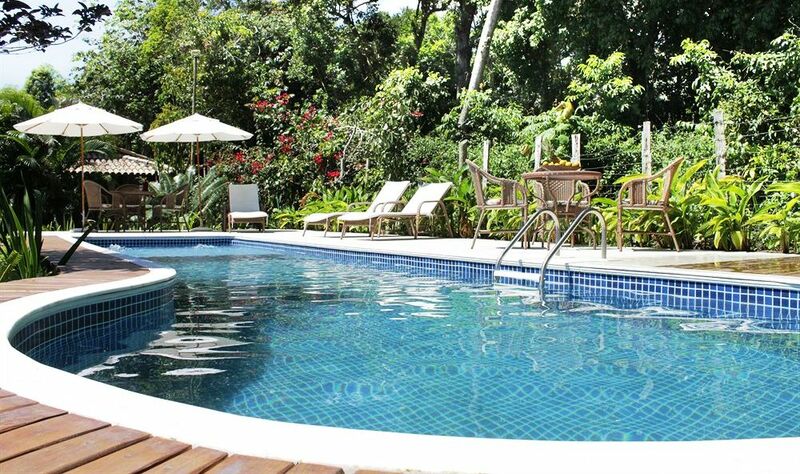 But unlike other luxury resorts, none of it is overt or in your face. Here the vibe is distinctively relaxed and bohemian with young professionals and a whirl of Brazilian and international celebrities mixing casually with ordinary people. Mario Testino recently did a Vogue photo shoot in Trancoso and the list of A-List celebrities holidaying here reads like an awards ceremony, with Beyoncé, Matthew McConaughey and supermodels Kate Moss and Naomi Campbell stealing the headlines. Despite its growing star status, this beautiful holiday hot spot has retained its laid-back attitude. During the day, the shops are closed until 3pm because everyone, including the shop proprietor, has gone to the beach for the morning. Trancoso’s uneven cobblestone streets, mud roads and brightly coloured one-story buildings have been left unaltered but look a little closer and behind the ramshackle facade you’ll notice they’re now filled with modern galleries selling art and sculptures, health spas offering beauty treatments and waiters in tight fitting Italian shirts serving up creative plates of fusion food. 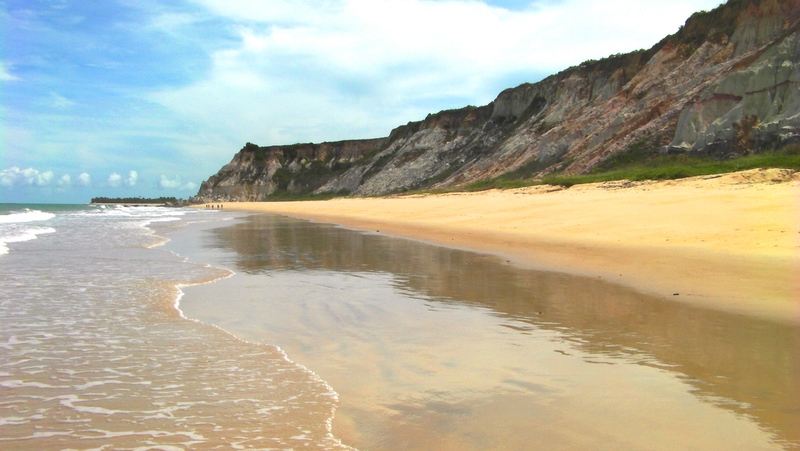 As our accommodation was in Arraial d’Ajuda, we decided to make a day trip to Trancoso and what better way to see the incredible coastline than to walk the whole 13 kilometers! If this doesn’t appeal, there are regular buses shuttling between the villages each hour but the gorgeous scenery along the way is well worth the effort. The pristine beaches are backed by tall pink cliffs topped with tropical vegetation. The sand was powdery soft, almost squeaky underfoot and the sea was clear and calm. Walking at a casual pace and allowing for a few stops for refreshments at a number of small beachside stalls, it took us around three hours for the one way journey. 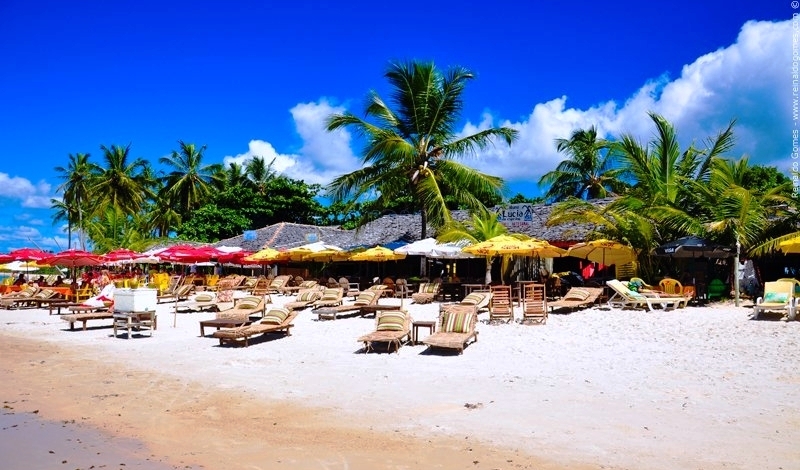 We instantly knew we’d arrived in Trancoso when we spotted the club-house-bars scattered along the beach where tanned and toned partygoers mingled. Sipping cocktails and lounging on rustic king-size beds scattered with leopard print pillows was the order of the day. Shoes were very much optional whilst creative tattoos and tiny bikinis ruled. Smooth chilled out dance beats drifted across the beach to the water’s edge and it felt like we were at Café del Mar! 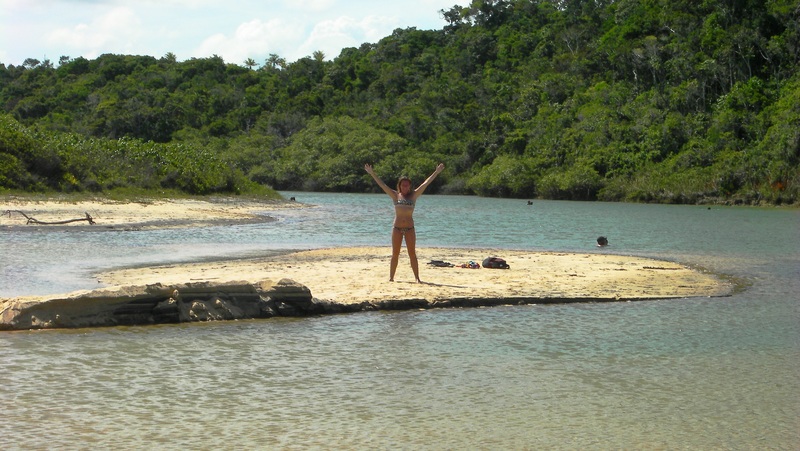 The beaches around Trancoso were pristine and very eco-friendly. Tight building restrictions have thankfully prevented large scale developments, so apart from a couple of low key holiday homes, the beaches remain deliciously un-commercialised. It’s just you, the palm trees and the bluish-green Atlantic waves sliding onto silky soft sand. 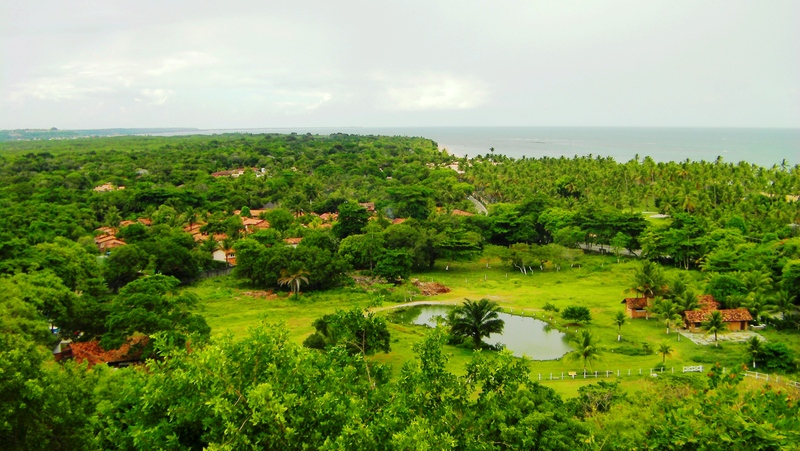 Trancoso is situated on top of tall, pink cliffs overlooking the ocean and to reach the village it’s a steep uphill walk through twisted mangroves on a muddy track. The walk will get your pulse racing after a leisurely day at the beach but the views from the top are sensational. 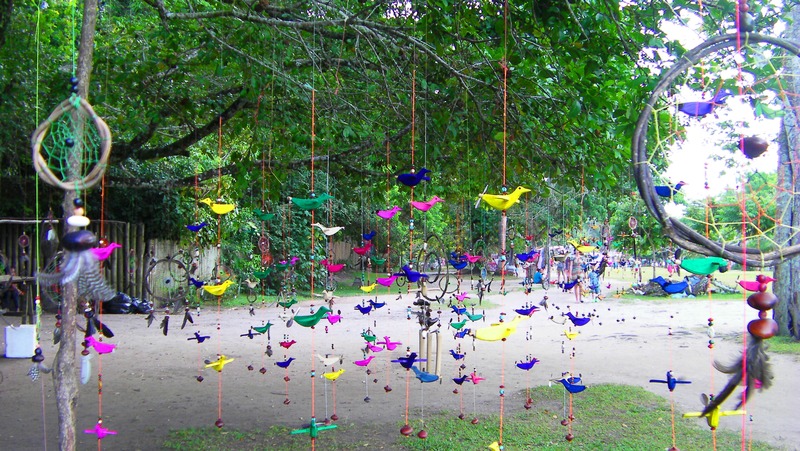 At the heart of Trancoso, lies a grassy, open field called the Quadrado. With its village-green feel, this spot is the centre of life here. One end of the green is filled with the white São João Batista church, built by indigenous people in the 16th-century, and one of Brazil’s oldest. 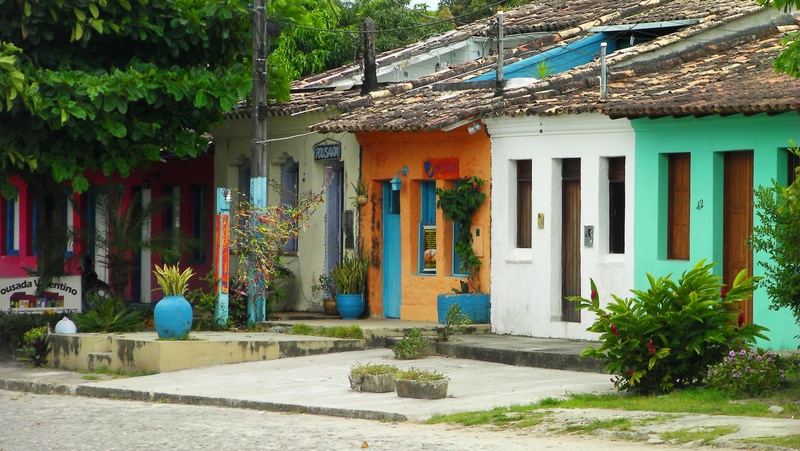 Around the Quadrado colourfully painted cottages are now home to area’s best cafés, restaurants and shops. As the sun started to set we made a bee-line for an artisan ice-cream shop and indulged in kiwi and coconut flavoured ice-cream. The square was a beautiful sight at night with wide-reaching tree branches filled with sparkling lights. Friends gathered at alfresco tables to share a drink and tales of adventure. 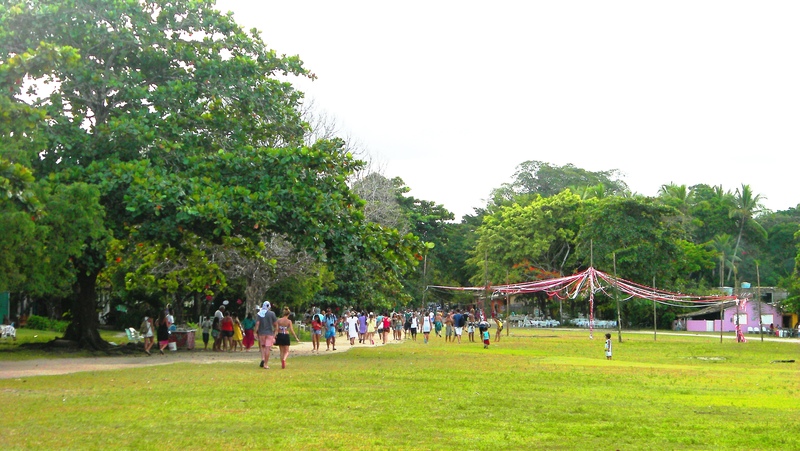 Kids rushed around on the grass doing cartwheels and playing games of football barefoot. We enjoyed browsing through the many designer shops selling chic jewellery, handcrafted wood furniture, scented candles and expensive toiletries. Then we pulled up a chair at restaurant and bar Cantinho Doce to soak up the atmosphere and indulged in several delicious caipirinha cocktails made with lashings of cachaca (Brazilian sugar cane brandy) fresh lime and sugar to sweeten. Bars and clubs are open from late until dawn. Partygoers dance on sandy floors pumped up by international DJ’s and top of the range sound systems. They sip vodka tonics and dry martinis. The look is smart but casual as killer heals are replaced by flat sandals and designer suits replaced by shorts and polo shirts. There’s a vibrant energy and sense of freedom as crowds of manicured men and women are released from the chains of their privileged worlds. They celebrate by throwing their hands in the air and grooving the night away. 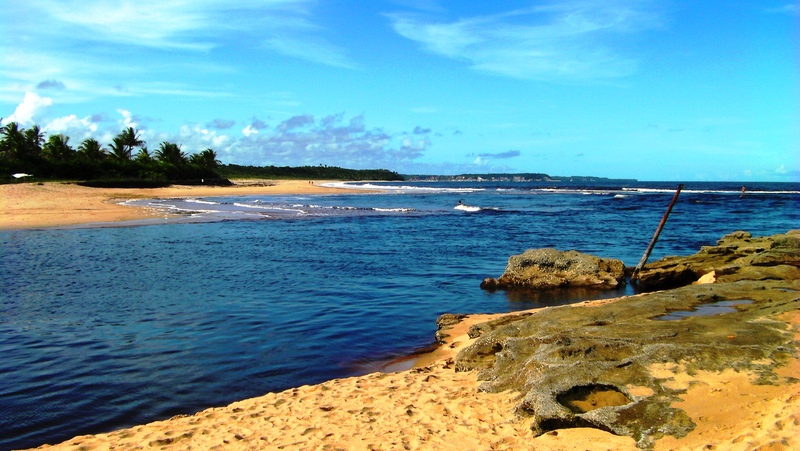 The tiny village of Caraiva is located on one of Bahia’s most remote and beautiful coastal stretches. It’s a far flung destination that people only dream still exists in the modern day world. 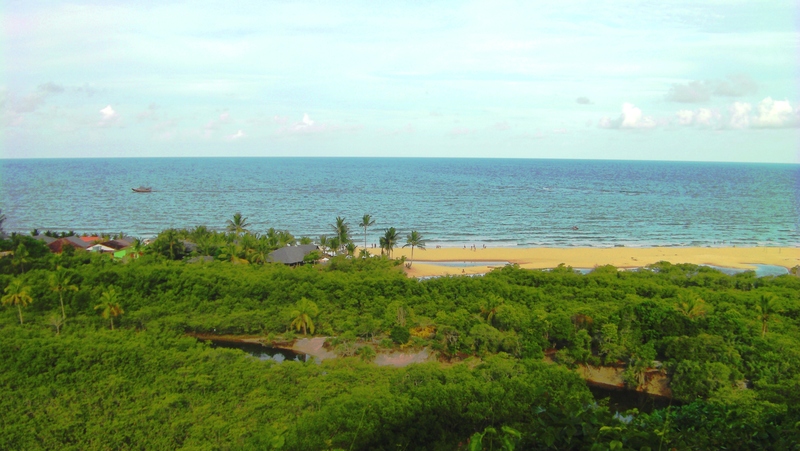 Many would say that arriving in Caraiva is like turning the clock back in Trancoso by 20 years, before the road was built and the glitterati arrived. 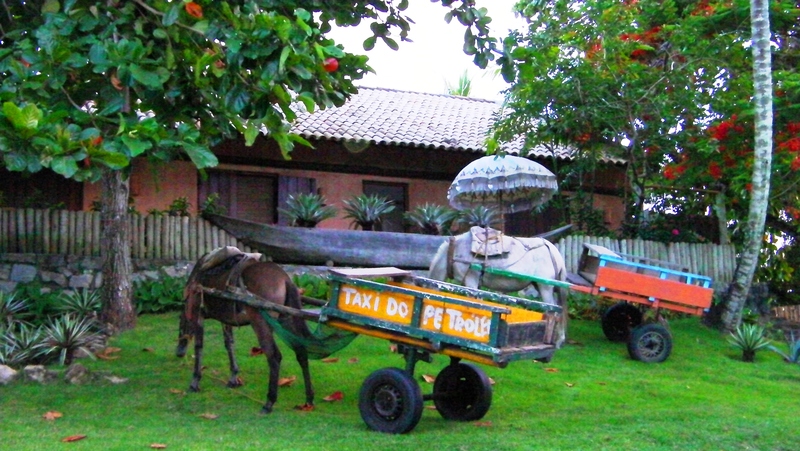 The streets are lined with sand so instead of cars, donkeys pull wooden carts with the word “taxi” painted on the side. The village has no electricity, no banks, no supermarkets and phone signals can be patchy, yet despite this, a rustic sophistication prevails. A laid-back (virtually horizontal) pace of life thrives here and holidaymakers spend their time relaxing on golden sands and indulging in sizzling plates of fresh fish washed down by cold beer. For free-spirited travellers and those looking for a slice of the good life, Caraiva is as close to heaven as you can get. As our bus shuddered along a potholed dirt track towards Caraiva, we hoped we’d made the right decision. We’d been seriously close to scratching Caraiva off our ‘to visit’ list with the thought of another dusty and uncomfortable bus ride from Trancoso. Two buses per day make the two hour trip but rain can play havoc with the dirt roads leaving Caraiva cut off from the outside world for days. 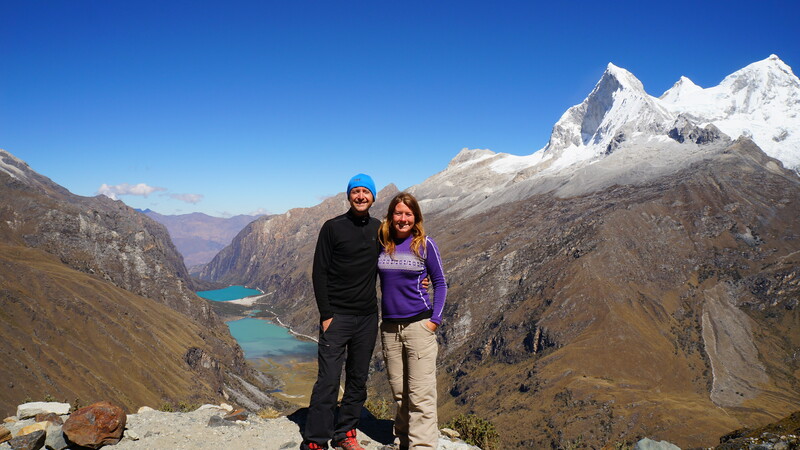 However, as remote places often offer the biggest rewards, we had a feeling something special was lying in wait for us. Our excitement mounted as we passed beautiful forests and grassland areas with grazing buffalo and as the bus stopped at the Rio Caraiva crossing, we were instantly seduced. The village has built up along the eastern bank of a wide river and it faces an idyllic stretch of palm-tree lined beach with churning waves. There’s not much, which is part of the charm. 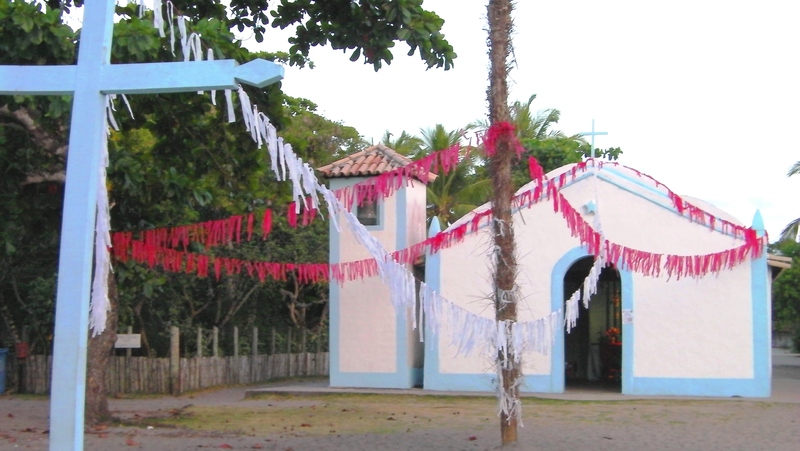 The centre of the village has a small square with a white church and a handful of brightly painted, low-rise cottages which serve as homes, pousadas and a small selection of restaurants. 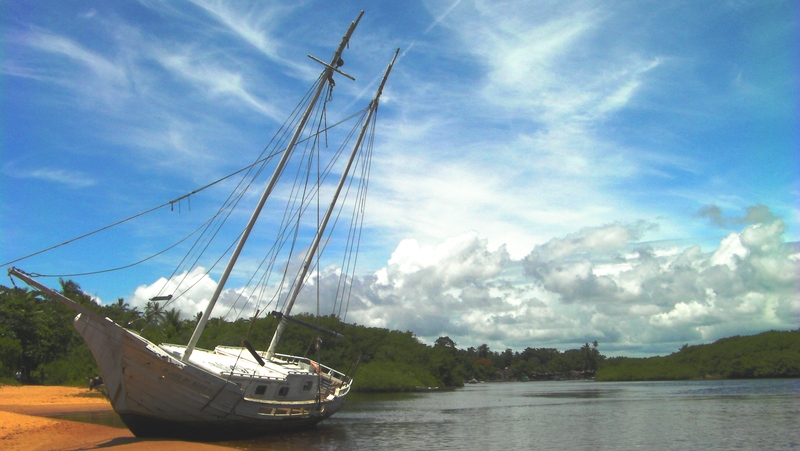 Wooden boats and dug-out canoes are tucked into the mangroves and are used by locals for fishing and transport. The lazy sloths hanging upside down in the tall trees summed up the mood of this village. The vibe is laid back and carefree. There is no pretence or snobbery, with scruffy beachwear and friendly smiles the norm. During the day, butterflies fluttered around us as we strolled through the lanes, and at night hundreds of tiny bright stars lit the pathways. 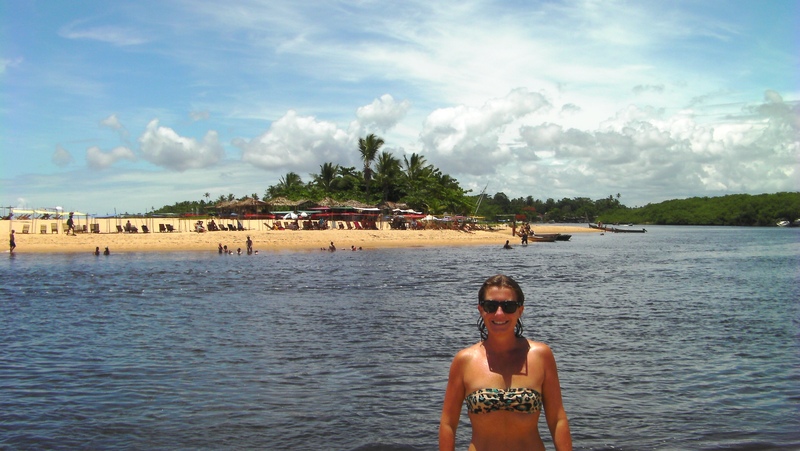 There are a small number of simple pousadas and campsites located along the river and facing the beach. Most are wooden, one-story houses with cute rooms around decked seating areas with family run restaurants. Expect modest furnishings but hot water, ceiling fans and decent beds with linen are standard. The busiest time of the year is December to February so consider booking ahead during this period but throughout the rest of the year you’ll have the pick of the crop to yourself. 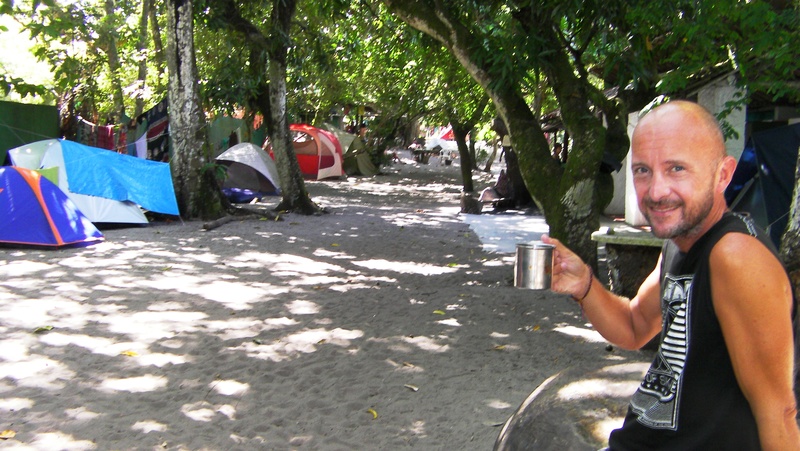 We embraced our natural surroundings and decided to pitch our tent around Camping Caraiva Carleto’s spacious garden. The site was clean and secure with a very tranquil atmosphere. With shady sites, big bathrooms, a kitchen and a communal lounge with free WiFi for guests (when it worked) we couldn’t have asked for anything more. In the place of fluffy duvets we snuggled into our sleeping bags and instead of mood lighting we lit a couple of candles. We ate simple but delicious food each day. Breakfast is usually included in the price of your pousada (not for camping) and there are a few small shops to buy groceries and vegetables to cook for yourself. Eating in local restaurants is a real pleasure. 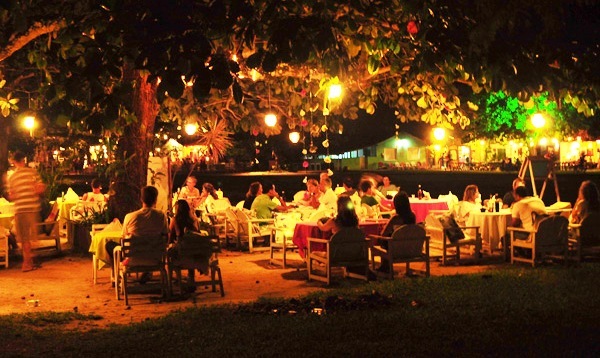 Plates are filled with home-cooked Bahian food such as rice and beans, hearty stews and delicious fresh fish and shrimps. The restaurant owners like to add their own creative style to their restaurants so look out for wind chimes made from driftwood, and funky artwork. One excellent option for an international food fix is the riverside pizzeria serving stone baked pizzas on its terrace. We couldn’t decide if the food or the views were the most delicious! Caipirinha cocktails and cold cans of Skol beer are served everywhere. 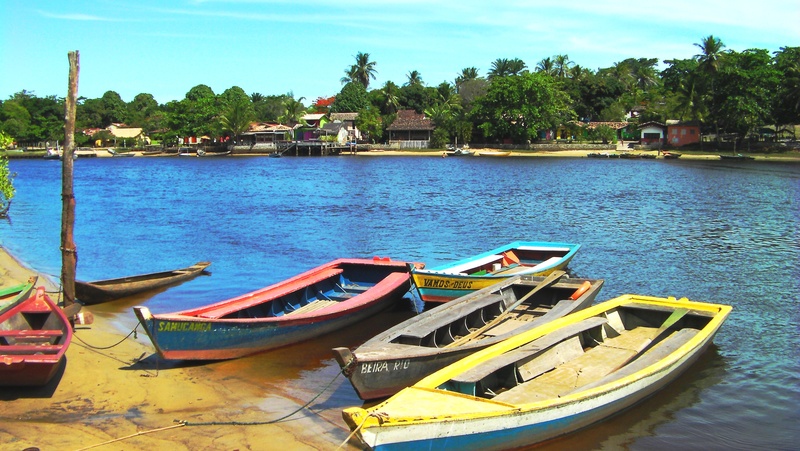 Pousadas can arrange a number of fun activities including fishing, upriver canoe trips to spot wildlife and horse riding on the beach. One of the most culturally rewarding activities is a visit to the native Indian Pataxó Hãhãhãe tribe who live 6 kilometres away in the Caramuru-Paraguaçu reserve. They are one of seven tribes who live in Bahia as they have done for centuries, but these days with a few modern day conveniences. This reserve was created at the beginning of the twentieth century by the Indian Protection Service and now close to 50,000 Indians lives here. The welcoming tribe offer visitors an insight into their lives demonstrating archery, weaving, cooking and even making jewellery and feather head-dresses! Of course at the end of your visit, there’s a chance to purchase handicrafts from the now commercially aware tribe. It’s possible to walk for miles along the beach in either direction with little sign of civilisation. Walking north requires crossing the mouth of the river (it comes up to your neck as I discovered) and if you don’t fancy getting wet you can pay small change for a local boatman to row you across (as Dan discovered). The beaches along this stretch are dreamy. The sand is powdery soft and the sea is crystal clear and lukewarm. Off shore reefs calm the sea and make it perfect for swimming. As the tide goes out golden sandbars create natural pools and mirror-like reflections. There is virtually no infrastructure along this stretch so take a bottle of water and some lunch with you. Like us, you’ll want to keep pushing on to see what’s around the next corner and you’ll walk for miles! About an hour into the walk and like a mirage in the desert, a small café (the name of which we never knew) appears from nowhere and is a brilliantly scenic spot to indulge in a well-deserved half way beer. 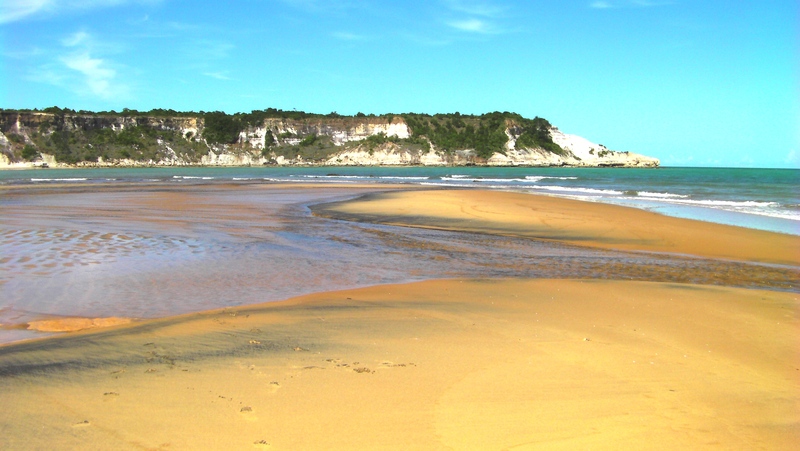 It’s possible to complete a 12 kilometre walk to postcard perfect Espelho Beach and then time your return trip with the bus from Trancoso to Caraiva. The walk involves traversing several long beaches, climbing a headland and following small path through shrub-land but if like us, you slept in late and you’re feeling less energetic to cover the whole distance, there are many equally gorgeous spots along the way. This stretch of coastline has been dubbed the ‘Discovery Coast’ and it certainly won’t disappoint whatever your taste as there’s something to please everyone. The area is unified by its beautiful environment, gorgeous beaches and a distinctly bohemian vibe but divided by the scale and type of tourism being developed, along with the crowd this attracts. From humble beginnings Arraial D’Ajuda, Trancoso and Caraiva all forged their own unique personalities and continue to develop. From our point of view, the further south from Puerto Seguro we ventured, the more we fell in love. Our own slice of paradise was undoubtedly rustic Caraiva, which is quite ironic considering it was the one place we almost didn’t bother travelling to. 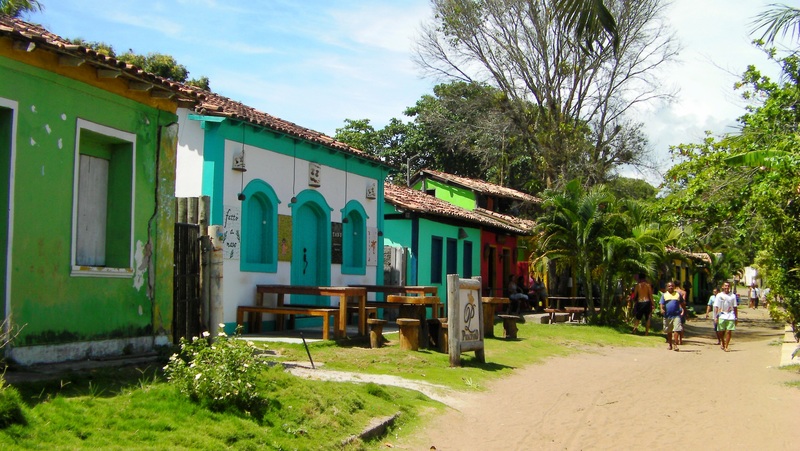 Arriving in this magical village we gained a sense of the good life the Sao Paulo college students were searching for back in the 1970’s – adventure, freedom and tranquillity.